Let me say that I am a HUGE fan of Metal Slug. I have played it for years and enjoyed all of it, all the time. It had a military feeling that existed throughout Metal Slug 1. I think the huge fans of this game go into the mindset that the military feeling was Metal Slug. Perhaps if the aliens and robots, etc. were introduced to us in 1996, we would expect all of those things. -I don't know... but I do know that I wasn't pleased with MS3. In my mind, when I see Metal Slug, I see a soldier busting through a forest of armored guns and soldiers, all firing at me. I cannot envision Man-Eating Plants, Aliens, Zombies etc. This was what I feared Metal Slug would become. When I first plugged in Metal Slug 3, I expected enemy soldiers, or one of those middle eastern fellows from MS2, but what did I get? Crabs. Giant Crabs. Visually, this game is eye-candy, I mean, this is the best on the Neo-Geo. It really is excellent. So are the controls, and so is the sound. But what is that without fun-factor? This game is NOT fun, it hurts me when I play it. It's very hard, and I can't have any fun when I keep dying. I have no time to enjoy the backgrounds or anything around me. I sadly can say that I view this is a waste of my hard-earned $300, which could have gone towards Neo-Geo games that I knew I love. After about a week, I tired very quickly of Slug 3. Sure, I pick it up on rainy days, but it never keeps my attention for more than twenty minutes. 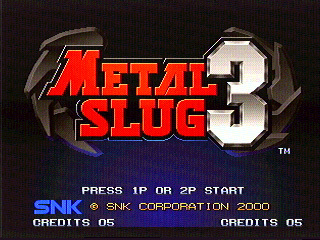 If I had Metal Slug 1, or 2, I might be playing it now... but not MS3 -it will be a while until I pick it up again. If you think of Metal Slug as heavy artillery, soldiers and tanks, MS3 may not be your game. If you can transform this original idea of Metal Slug into a game but with less soldiers, aliens, robots, and man-eating plants, then give Metal Slug 3 a try. To me, this isn't Metal Slug.